Liszt began Via Crucis in 1866 when he lived near the Colosseum at the Church of Santa Francesca Romana, and finished it at the Villa d’Este in the summer of 1878. A copyist’s manuscript with Liszt’s autograph corrections containing three versions of the work, one choral, one for organ solo, and one for piano solo, is dated by the composer ‘F. Liszt Budapest 26 Février 79’. In 1874 he wrote that the work would not be ‘learned or ostentatious’, but ‘simple reflections of my youthful emotions—which remain indestructible across all the trials of the years!’ The texts were chosen by the Princess Wittgenstein, whom Liszt thanked in 1877: ‘You have arranged admirably the texts for the Via Crucis. I shall try to thank you in my composition …’ The work was rejected for publication by Pustet in Regensburg basically because it was too original and would not sell. It remained unpublished and unperformed in Liszt’s lifetime. The first performance took place in Budapest on Good Friday 1929, conducted by the composer Artur Harmat, Professor of Church Music at the Liszt Academy (the Department of Church Music was abolished in 1950 and reinstated in 1989). ‘The Way of the Cross’ is a devotion which describes the journey of Christ carrying the Cross, divided into fourteen stages or ‘stations’. Most Catholic churches have pictures or statuettes of these scenes along the walls of the nave, usually seven on each side. The devotion consists of meditations on each scene, usually in the form of prayers and singing. If the number of participants is not too large, they move around the church in a group, stopping at each station. This was what Liszt visualized when he composed the music. The devotion originated with the Franciscans, who as guardians of the holy places in Jerusalem began to erect models in their churches, which acted as a substitute for an actual visit to Jerusalem. In the eighteenth century the order was allowed to grant permission for stations to be erected in other churches. The devotion is a form of Passion, and is particularly associated with Lent. The number of stations has not always been fourteen; sometimes as few as eleven were used. Today it is common to add a fifteenth in order to end with the Resurrection rather than with the tomb. Although Liszt set only the fourteen stations, he adds a short epilogue in keeping with the positive ending favoured today. 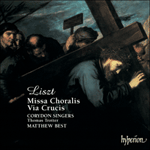 It is clear that Via Crucis belongs among the most personal works of Liszt. In particular its theme of the Cross relates it to other works. Liszt in fact used a three-note musical symbol of the Cross (consisting of a rising tone plus minor third, soh-lah-doh, an intonation from plainsong) in several works, including the male-voice Mass, the Gran Mass, the symphonic poem The Battle of the Huns and the ‘Dante’ Symphony. It can also be found in the two oratorios, The Legend of St Elisabeth and Christus, as well as the Faust-Symphonie, the First Piano Concerto and the B minor Piano Sonata. Here Liszt uses the motif, quite logically, to set the words quoted in his preface: ‘O crux, ave’, sung immediately before Station I. Via Crucis belongs to the large group of works by Liszt based on pictures or statues. The list is too long to give here, but pianists will think straightaway of Sposalizio, Il Penseroso, and the two St Francis Legends. Among the orchestral works are Orpheus, The Battle of the Huns and From the Cradle to the Grave. As programme music, the interest of these works lies partly in how Liszt added the time element to an art form that does not contain it—a picture is static and unchanging. In many cases Liszt chose the picture for what it symbolized—usually something with a religious content. Although he is credited with formal innovations, his real genius lay in creating musical character—an originality amounting to new coinage, both thematic and harmonic. Liszt renewed the musical language, which is why he was so influential. It is the immediacy of his message which is arresting, and this may explain the visionary nature of some of his early and late music. Liszt does not present a musical argument; he gives statements. This literal cast of mind works well in the religious works. In Christus the storm is a storm (a terrific orchestral noise), the miracle a miracle (the orchestra falls silent at the voice of Christ); the nativity is child-like, the three kings are splendid, the Crucifixion is terrible. In Via Crucis, the same mentality operates, but as if through a magnifying glass, creating intense miniatures. The nailing to the Cross is conveyed in hideous grinding staccato discords. The compassion of Veronica lies in the curve of an unadorned melodic line. The carrying of the Cross produces a heavy mind-numbing trudge. The meeting with Mary is a mixture of anguish and heart-ease in music of great harmonic originality. Liszt is direct, uncompromising—and extremely modern. His method is expressionistic. He says to us: ‘This is real.’ In Via Crucis we meet the man who believed. As a programmatic composer, Liszt was able to provide the musical equivalent of a meditative commentary, along the lines of the texts printed in books of the Stations. An example is his use of the Stabat Mater at the three stations where Jesus stumbles (Nos III, VII, IX). Here we see Mary with Jesus in the picture at these points. Another striking comment is perhaps theological: when the women of Jerusalem meet Jesus, he tells them not to weep for him, but for their children. Liszt at this point adds a vivid passage for the organ redolent of martial trumpets, but unresolved in its tonality, indeed including fortissimo whole-tone chords. It may be that Liszt is referring to the ‘tuba mirum’ of the Day of Judgment. Again, tonality here is also a comment. The key of the work is D minor, and this reflects Liszt’s ‘service for the souls of the dead’ comment, as nearly all Liszt’s D minor works have this association (for example De Profundis of 1834 for piano and orchestra, the ‘Dante’ Sonata, Totentanz, and Mazeppa—who ‘dies’, then rises). The ending in D major restates the music for Mary. Liszt used two Latin hymns and two German chorales. The Latin hymns are Vexilla regis and Stabat Mater. Both melodies are found in the Liber Usualis, and were used by Liszt in other works. Vexilla regis occurs at Vespers on Passion Sunday, and was used as the basis of an extensive piano piece in E minor in Rome. The Stabat Mater melody is found at Vespers on the Feast of the Sorrows of the Virgin, and was used as the basis of the huge Stabat Mater in Christus, as well as in a piano solo version of the melody in A flat. In Via Crucis only verse 1 is sung, but three times in different keys. The German melodies are O Haupt voll Blut und Wunden, and O Traurigkeit, O Herzeleid, both found in a collection of chorales arranged by Liszt for the piano. Both are known in harmonisations by Bach, but here the harmony is Liszt’s own. Liszt commença la Via Crucis en 1866, alors qu’il vivait près du Colisée, à l’église de Santa Francesca Romana, et l’acheva à la Villa d’Este, durant l’été de 1878. Un manuscrit de copiste, avec des corrections autographes du compositeur et trois versions de l’œuvre (chorale, pour orgue solo, pour piano solo), est daté, par Liszt lui-même, «F Liszt Budapest 26 Février 79». En 1874, il écrivit que la pièce ne serait pas «érudite ou ostentatoire», mais «de simples reflets de mes émotions juvéniles—qui demeurent, indestructibles malgré toutes les vicissitudes des ans!». Les textes furent choisis par la princesse Wittgenstein, que Liszt remercia en 1877: «Vous avez admirablement agencé les textes pour la Via Crucis. Je m’efforcerai de vous remercier dans ma composition». L’œuvre fut refusée par Pustet, à Regensbourg, essentiellement parce que, trop originale, elle ne se serait pas vendue. Demeurée inédite et injouée du vivant de Liszt, elle fut créée à Budapest le Vendredi saint 1929, sous la direction du compositeur Artur Harmat, professeur de musique religieuse à l’Académie Liszt (supprimé en 1950, ce département de musique religieuse fut rétabli en 1989). «Le chemin de la croix» est une dévotion qui décrit, en quatorze «stations», ou étapes, le chemin parcouru par le Christ en portant la croix. La plupart des églises catholiques abritent des représentations ou des statuettes de ces scènes aux murs de leur nef (en général, sept de chaque côté). Cette dévotion consiste en méditations sur chaque scène, habituellement sous forme de prières et de chants. S’ils ne sont pas trop nombreux, les participants font le tour de l’église en groupe, en faisant halte à chaque station. Voilà ce que Liszt avait en tête lorsqu’il composa sa musique. Cette dévotion naquit chez les Franciscains qui, en tant que gardiens des lieux saints à Jérusalem, commencèrent d’ériger des miniatures dans leurs églises, substituts à une vraie visite de Jérusalem. Au XVIIIe siècle, l’ordre fut autorisé à octroyer des permissions pour que des stations fussent érigées dans d’autres églises. Cette dévotion, qui est une forme de Passion, est particulièrement associée au Carême. Le nombre de stations n’a pas toujours été de quatorze—il est même, parfois, descendu à onze. De nos jours, il est courant d’ajouter une quinzième station pour terminer avec la résurrection plutôt que le tombeau. Bien qu’il mît en musique les seules quatorze stations, Liszt adjoignit un bref épilogue, conformément à la conclusion positive actuellement privilégiée. Dans sa préface, Liszt évoque le chemin de la croix comme «un service pour les âmes des morts». Il décrit également un service des Stations auquel il assista un Vendredi saint, en plein air, au Colisée, et suggère que, en une autre occasion, un harmonium pourrait éventuellement être utilisé pour soutenir la musique. «Je serais cependant vraiment heureux si, un jour, ma musique pouvait y résonner, même si cela ne suffirait pas à exprimer mon émotion la plus secrète, celle qui me submergea lorsque, là, au cœur d’une pieuse procession, je m’agenouillai et répétai à plusieurs reprises les mots: O! Crux Ave! Spes unica!». Via Crucis compte, à l’évidence, parmi les œuvres les plus personnelles de Liszt—le thème de la croix, notamment, la rattache à d’autres pièces. Liszt recourut, en réalité, à un symbole musical de la croix fait de trois notes (consistant en un ton ascendant, plus une tierce mineure, sol-la-do, une intonation du plain-chant) dans plusieurs de ses œuvres, dont la Messe pour voix d’hommes, la Messe de Gran, le poème symphonique La Bataille des Huns et la Dante Symphonie. On le retrouve également dans ses deux oratorios, La Légende de Ste Élisabeth et Christus, ainsi que dans la Faust-Symphonie, le Premier Concerto pour piano et la Sonate pour piano en si mineur. Dans le cas présent, Liszt utilise ce motif, fort logiquement, pour mettre en musique les mots cités dans sa préface: «O crux ave», chantés juste avant la Station I. Via Crucis appartient à un vaste corpus d’œuvres de Liszt fondées sur des représentations ou des statues. Les énumérer ici serait trop long, mais les pianistes songeront d’emblée à Sposalizio, à Il Penseroso et aux deux Légendes de saint François. Parmi les œuvres orchestrales, citons Orpheus, La Bataille des Huns et Du berceau à la tombe. En tant que musique à programme, ces œuvres valent en partie pour la manière dont Liszt ajouta l’élément temporel à une forme artistique qui en est veuve—une représentation est statique, immuable. Bien souvent, Liszt choisit le tableau pour ce qu’il symbolisait (généralement, une chose au contenu religieux). Quoique crédité d’innovations formelles, son vrai génie réside dans la création d’un caractère musical—une originalité qui, en fait, revient à une nouvelle invention, et thématique et harmonique. Liszt renouvela le langage musical: voilà pourquoi il fut si influent. C’est l’immédiateté de son message qui est saisissante, ce qui peut expliquer la nature visionnaire de certaines de ses pièces de jeunesse et d’une part de sa musique tardive. Liszt n’offre pas d’argument musical: il énonce des assertions. Cette tournure d’esprit littérale fonctionne bien dans les œuvres religieuses. Dans Christus, la tempête est une tempête (un terrifiant bruit orchestral), le miracle un miracle (l’orchestre fait silence à la voix du Christ); la nativité est enfantine, les trois rois sont splendides, la Crucifixion est terrible. Dans Via Crucis, la même mentalité opère, mais comme à travers un verre magnifiant, source de miniatures intenses. Le clouement à la croix est traduit par de hideuses et grinçantes dissonances staccato. La compassion de Véronique repose dans la voussure d’une ligne mélodique dépouillée. Le portement de croix induit une marche pénible, pesante, qui transit l’âme. La rencontre avec Marie est un mélange d’angoisse et de traquillité, dans une musique d’une grande originalité harmonique. Liszt se montre direct, inflexible … et infiniment moderne. Sa méthode est expressionniste. Il nous dit: «C’est vrai». Via Crucis nous fait rencontrer l’homme qui crut. Compositeur programmatique, Liszt put fournir l’équivalent musical d’un commentaire méditatif, dans la lignée des textes imprimés dans les livres des Stations, comme l’atteste son usage du Stabat Mater aux trois stations où Jésus trébuche (nosIII, VII, IX). À ces moments-là, nous voyons Marie avec Jésus, sur le tableau. Autre commentaire saisissant, peut-être théologique: lorsque les femmes de Jérusalem rencontrent Jésus et que ce dernier leur dit de pleurer non sur lui, mais sur leurs enfants, Liszt ajoute un passage éclatant, adressé à l’orgue, qui rappelle les trompettes martiales mais est, dans sa tonalité, non résolu (il inclut des accords par tons fortissimo). Peut-être Liszt se réfère-t-il à la tuba mirum du Jugement dernier. De nouveau, la tonalité, en l’occurrence ré mineur, est un commentaire, qui reflète le «service pour les âmes des morts», car presque toutes les œuvres lisztiennes en ré mineur présentent cette association (ainsi le De profundis de 1834, pour piano et orchestre, la Dante-Sonate, Totentanz, et Mazeppa—qui «meurt», puis ressuscite). La conclusion en ré majeur ré-énonce la musique pour Marie. Liszt recourut à deux hymnes latines et à deux chorals allemands. Les hymnes latines, Vexilla regis et Stabat Mater, qui figurent toutes deux dans le Liber Usualis, furent utilisées par Liszt dans d’autres œuvres. Vexilla regis, qui est chantée aux vêpres du dimanche de la Passion, servit de base à une vaste pièce pour piano en mi mineur, à Rome. Quant à la mélodie du Stabat Mater, qui apparaît aux vêpres de la fête de Notre-Dame des Sept douleurs, elle servit de base à l’imposant Stabat Mater, dans Christus, et fut utilisée dans une version pour piano solo de la mélodie, en la bémol. Dans Via Crucis, seule la première strophe est chantée, mais trois fois et dans différentes tonalités. Les mélodies allemandes, O Haupt voll Blut und Wunden et O Traurigkeit, O Herzeleid, figurent toutes deux dans un recueil de chorals arrangés par Liszt pour le piano—elles sont connues dans des harmonisations de Bach, mais ici, l’harmonie est de Liszt. Liszt nahm Via Crucis 1866 in Angriff, als er in der Nähe des Kolosseums bei der Kirche Santa Francesca Romana lebte, und vollendete es im Sommer 1878 in der Villa d’Este. Das Manuskript eines Kopisten mit autographischen Korrekturen Liszts, das aus drei Fassungen des Werks besteht (einer Chorfassung, einer für Orgel solo und einer für Soloklavier), ist vom Komponisten wie folgt datiert: „F. Liszt Budapest 26 Février 79“. Im Jahr 1874 schrieb er über das Werk, es werde weder gelehrt noch prunkhaft sein, sondern eine schlichte Widerspiegelung seiner jugendlichen Empfindungen, die über die Mühsal der Jahre hinweg unauslöschbar geblieben seien. Die Texte wurden von der Fürstin Wittgenstein ausgesucht, und Liszt bedankte sich 1877 bei ihr mit der Versicherung, sie habe die Texte für Via Crucis bewundernswert gewählt. Die Herausgabe des Werks wurde von Pustet in Regensburg im wesentlichen deshalb abgelehnt, weil es zu originell war und darum nicht zu verkaufen sei. Es blieb zu Liszts Lebzeiten unveröffentlicht und unaufgeführt. Die erste Aufführung fand am Karfreitag des Jahres 1929 in Budapest statt, dirigiert von Artur Harmat, dem Komponisten und Professor für Kirchenmusik an der dortigen Liszt-Akademie (die Abteilung Kirchenmusik wurde 1950 geschlossen und 1989 wiedereröffnet). „Der Kreuzweg“ ist eine Andacht, die den Gang Christi mit dem Kreuz auf den Schultern beschreibt, unterteilt in vierzehn „Stationen“ bzw. Abschnitte. In den meisten katholischen Kirchen finden sich Gemälde oder bildhauerische Darstellungen des Geschehens entlang der Wände des Mittelschiffs, gewöhnlich sieben auf jeder Seite. Die Andacht besteht aus Meditationen über jede der Stationen, meist in Form von Gebeten und Gesang. Wenn die Zahl der Teilnehmer nicht zu groß ist, ziehen sie zusammen durch die Kirche und machen an jeder Station Halt. Das war es, was Liszt sich vorgestellt hat, als er die Musik komponierte. Die Andacht geht auf die Franziskaner zurück, die als Hüter der heiligen Stätten in Jerusalem anfingen, in ihren Kirchen Modelle aufzustellen, die als Ersatz für einen richtigen Besuch in Jerusalem dienten. Im achtzehnten Jahrhundert wurde der Orden ermächtigt, Genehmigungen zum Errichten von Stationen in anderen Kirchen zu erteilen. Die Andacht ist eine Art Passion und steht in besonderem Zusammenhang mit der Fastenzeit. Die Zahl der Stationen belief sich nicht immer auf vierzehn; manchmal verwendete man nicht mehr als elf. Heute ist es üblich, eine fünfzehnte dazu zu nehmen, damit am Schluß die Auferstehung anstelle der Grablegung steht. Liszt hat zwar nur die vierzehn Stationen vertont, fügt jedoch gemäß dem heute bevorzugten positiven Abschluß einen kurzen Epilog hinzu. Es ist klar ersichtlich, daß Via Crucis zu Liszts persönlichsten Werken zählt. Vor allem sein Kreuzthema verknüpft es mit anderen Werken. Liszt hat ein drei Töne langes musikalisches Symbol für das Kreuz (ansteigender Ton samt kleiner Terz—sol-la-do—eine Choral­intonation) in mehreren Werken eingesetzt, so auch in der Messe für Männerchor, der Graner Festmesse, der sin­fonischen Dichtung Hunnenschlacht und der Symphonie zu Dantes Divina commedia. Außerdem ist es in zwei Oratorien zu finden, der Legende von der heiligen Elisabeth und Christus, sowie in der Faust-Symphonie in drei Charakterbildern, dem Ersten Klavierkonzert und der Klaviersonate in h-Moll. Im vorliegenden Fall verwendet Liszt das Motiv logischerweise, um den in seinem Vorwort zitierten Text zu vertonen: „O crux ave“, der unmittelbar vor der ersten Station gesungen wird. Via Crucis gehört in die große Gruppe der Werke Liszts, die auf Gemälde oder Standbilder zurückgehen. Die Liste ist zu lang, um sie hier aufzuführen, aber Pianisten werden sofort an Sposalizio und Il Pensieroso denken, sowie an die beiden Légendes, die sich um Franz von Assisi drehen. Von den Orchesterwerken sind Orpheus, die Hunnenschlacht und Von der Wiege bis zum Grabe zu nennen. Als Programmusik ist die Bedeutung dieser Werke zum Teil darin begründet, daß Liszt das zeitliche Element in eine Kunstform einbringt, die es nicht enthält—eine bildliche Darstellung ist statisch und unveränderlich. In vielen Fällen hat Liszt das betreffende Bild wegen seiner symbolischen Aussage gewählt—meist im Zusammenhang mit religiösem Gehalt. Obwohl ihm formale Innovationen zugeschrieben werden, äußerte sich sein wahres Genie im Erzeugen musikalischen Charakters—in einer Originalität, die auf thematische und harmonische Neuprägungen hinauslief. Liszt hat die Musiksprache erneuert und war aus eben diesem Grund so einflußreich. Es ist die Unmittelbarkeit seiner Aussage, die besticht, und das mag die visionäre Natur einiger seiner frühen und späten Werke erklären. Liszt legt kein musikalisches Argument vor; er gibt Erklärungen ab. Diese wortgetreue Haltung paßt gut zu den sakralen Werken. In Christus ist der Sturm ein Sturm (ein mächtiges Orchestergeräusch), das Wunder ein Wunder (das Orchester verstummt beim Klang der Stimme Christi); die Geburt des Heilands ist kindlich, die Heiligen Drei Könige sind prachtvoll, die Kreuzigung ist furchtbar. In Via Crucis herrscht die gleiche Mentalität, jedoch wie durch eine Lupe betrachtet, so daß eindringliche Miniaturen entstehen. Das Festnageln am Kreuz wird durch gräßliche, knirschende Staccato-Mißklänge dargestellt. Das Mitgefühl der Veronika liegt in der Kurve einer schmucklosen Melodielinie. Das Tragen des Kreuzes wird musikalisch als beschwerlich dumpfes Stapfen dargestellt. Die Begegnung mit Maria ist eine Mischung aus Qual und Herzensruhe in Musik von großer harmonischer Originalität. Liszt ist direkt, kompromißlos—und ausgesprochen modern. Seine Methode ist expressionistisch. Er sagt zu uns: „Dies ist real“. In Via Crucis begegnen wir dem gläubigen Menschen. Als Komponist von Programmusik war Liszt in der Lage, das musikalische Äquivalent eines meditativen Kommentars abzugeben, im Sinne der Texte, die in Büchern über die Stationen des Kreuzwegs abgedruckt sind. Ein Beispiel ist der Einsatz des Stabat Mater für die drei Stationen, an denen Jesus strauchelt (Nr. III, VII, IX). Hier sehen wir Maria zusammen mit Jesus abgebildet. Ein anderer treffender Kommentar ist wahrscheinlich theologischen Ursprungs: Wenn die Frauen Jerusalems Jesus begegnen, sagt er zu ihnen, sie sollen nicht um ihn, sondern um ihre Kinder weinen. Liszt fügt an dieser Stelle eine lebhafte Passage für die Orgel ein, die an kriegerische Trompeten gemahnt, jedoch tonal nicht festgelegt ist, ja sogar fortissimo gespielte Ganztonakkorde umfaßt. Es könnte sein, daß Liszt damit auf die tuba mirum des Jüngsten Gerichts verweist. Hier ist die Tonalität wiederum als Kommentar zu verstehen. Die Grundtonart des Werks ist d-Moll, was der Äußerung Liszts über den Gottesdienst „zugunsten der Seelen der Verstorbenen“ entspricht—fast alle Liszt-Werke in d-Moll haben entsprechende Assoziationen (zum Beispiel das De Profundis für Klavier und Orchester von 1834, die „Dante“-Sonate, der Totentanz und Mazeppa—der „stirbt“ und dann aufersteht). Der Abschluß in D-Dur greift erneut die Musik für Maria auf. Liszt hat zwei lateinische Kirchenlieder und zwei deutsche Choräle verarbeitet. Die lateinischen sind Vexilla regis und Stabat Mater. Beide Melodien sind im Liber Usualis zu finden und wurden von Liszt auch in anderen Werken eingesetzt. Vexilla regis gehört zum Vespergottesdienst am zweiten Sonntag vor Ostern (Passionssonntag) und wurde in Rom als Grundlage für ein langes Klavierstück in e-Moll benutzt. Die Melodie des Stabat Mater kommt beim Vespergottesdienst zum Gedächtnis der Schmerzen Mariens vor und hat als Grundlage sowohl des gewaltigen Stabat Mater in Christus als auch einer Soloklavierversion der Melodie in As gedient. In Via Crucis wird nur die erste Strophe gesungen, aber dreimal in jeweils anderer Tonart. Die deutschen Melodien sind O Haupt voll Blut und Wunden und O Traurigkeit, o Herzeleid, die beide in einer von Liszt für Klavier bearbeiteten Choralanthologie zu finden sind. Beide sind in Vertonungen von Bach bekannt, der vorliegende Satz stammt jedoch von Liszt selbst. and from death brought life. God reigned from the Cross. Amen. and wipe out the sins of the guilty. Amen. I am innocent of the blood of this just man. filled with pain and scorn. With a crown of thorns! Ist das nicht zu beklangen? is carried to the grave. O sadness, O heartfelt pain.